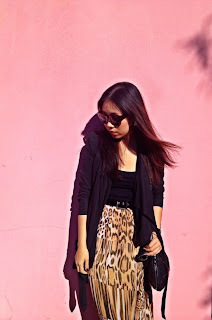 Before starting this blog, I sometimes write my journal in my Hi5 page,and of course fashion related. 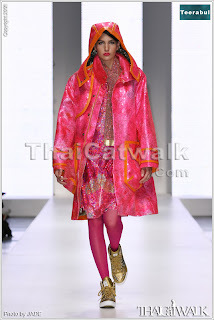 This below is my "editorial stuff" (I have serious while watching that show,gather up what I have seen,and write down to this story).The editor of ThaiCatwalk like it....I'm happy!! 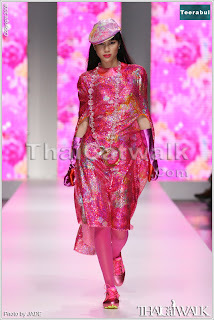 His inspirational fiction of Barbara Cartland’s honeymoon….really ‘up beat’ for the last show of the runway. 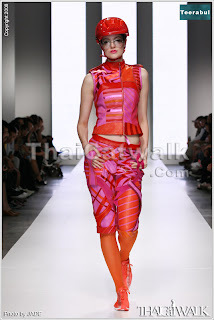 The last day of the Thailand Graduate Fashion Week 2008 was really shiny from the amazing Material Girl, the collection of Teerabul Songvich. From his super imagination of Barbara Cartland’s honeymoon trip at St.Moritz where most of rich people go for ski trip has inspired him to create this hip, cool, shiny, and super-sophisticated collection. All of eight looks which he has been selected for the show “sounds small, but very large in detail qualities” as he has mentioned before the show begin. 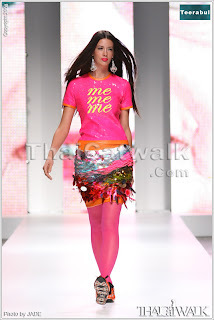 The first look of the show appears the bright pink neon T-shirt says ‘me me me ’ and bottom for bright orange leather with the fish scaled in sequin details. 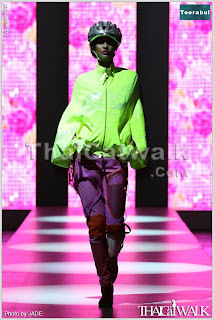 Next, look as the ski rich lady who wears Swarovski red ski helmet with the perfect edgy ski gears, follow by the third look, the neon bright green jacket. I can say that everybody was excited see this piece, because he show his work process on this jacket. As the result, I hope that we all are very impress…cuz it’s super cool. 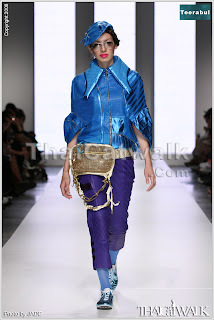 Forth look, the metallic-blue jacket with high details and texture, besides, there’s a golden Swarovski crystal belt bag which make this look more glamorous. Another half four looks, still make people’s eyes wide up, especially the accessories (e.g. Big diamond-ring Necklace,Foxy sequin, metallic purple gloves). The journal is getting too long, so..I better wrap it up. The show was amazing, music…brilliant. Let’s see…..two thumbs up will not be enough for his collection.